I'm using the Comic Vine catalog extension to pull data for TPBs, however the format they use is a little different from the way Comicster organizes trades. In comicster you add a trade (searches through volumes on Comic Vine), then a volume (again, the same), then an individual issue (searches through issues of the selected volume). 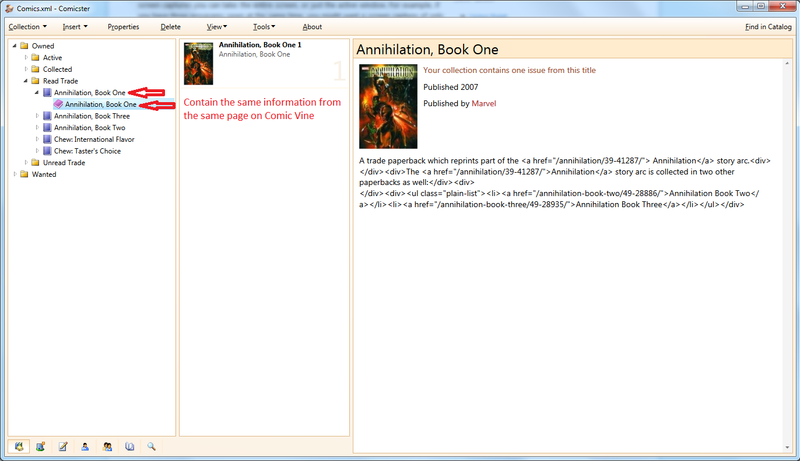 In Comic Vine the trades are structured as individual volumes, followed by a single issue. This may be nit-picking, but could the ability to add issues directly to a trade (in addition to normally adding to a volume in a trade) be impilemented? I was disappointed when I found that Comic Vine's format for trades didn't quite line up with Comicster's. In very early versions of Comicster a trade could only contain issues, and didn't have the intervening title. This worked well until I bought a trade (I think it was the Avengers/Defenders War collection) that contained issues from more than one title. It made me completely rethink how trades should work. Comic Vine has the benefit that in their internal database, an issue that belongs to a traade also belongs to a title somewhere else on the site. Comicster's online database works the same way - issues are connected directly to trades since we know their title anyway. However, in Comicster's local format, I can't do that. You might not own the issue as a stand-alone comic, so you probably won't have it stored in your collection inside it's original title. Every issue needs a title, so the only place that title can live is inside the trade. I get that it feels like duplicated data (and yeah, in 99.9% of trades that's the case), but unfortunately the current layout is the best way to represent what's going on. Closing due to this thread attracting spam. mabster closed this discussion on 29 Mar, 2012 11:45 PM. No more actions from Comicster or the discussion starter are required. This discussion is private. Only you and Comicster support staff can see and reply to it. 18 Jul, 2016 06:52 PM Comicvine is not working again. 24 Jan, 2015 08:24 AM Comicster keeps crashing!